Cocktails are magic! There are so many possible combinations of ingredients, tastes and colors. Everybody loves them. They can transform any moment into something special. So why don’t we make them more often? As rightly introduced in the video by the MixStik team on Kickstarter, cocktails are magic that add a special flavour to the moment making it more memorable. But then why don’t we make them often? Simple. The process is complicated; one has to find a suitable recipe, the ingredients and most important, mix them in their recommended order. Lot of work. What if all the heavy lifting was taken care of and you could just immerse yourself in the moment? MixStik is the answer to your worries! -Voila, the delicious cocktail is ready to be served! Beverages are an integral part of Human life. Fruit juices, shakes, cocktails and mocktails add a special flavour to the parties. So, a product which addresses a problem in this human centric space is bound to be closely related to HCC. 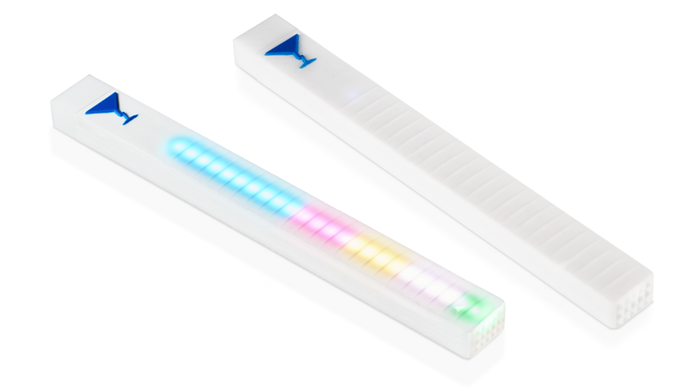 MixStik’s simple yet catchy light indicators guide the user in creating the concoction. The waterproof silicon body, with the design of a stick resembles the spoon and thus, build a quick empathy with the user. I think the appealing appearance, clear visibility and quick feedback of the MixStik as well as the app, makes the MixStick a well designed user centered product. -it can display the taste of the concoction making it easier for further subjective customization.